Enter the museums before the general public to see the Sistine Chapel at a quieter time. During Easter & summer, the Chapel may have some groups inside but never the hoards you'll see later. On quieter days you'll have it pretty much to yourself! See the best of the Vatican City in under four hours. 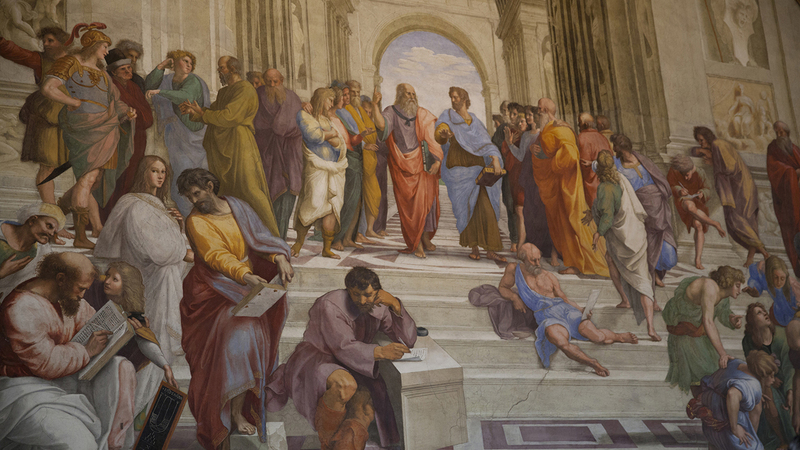 With a guided tour of the Sistine Chapel, a Vatican Museums tour (including the Raphael Rooms) and a St. Peter’s Basilica tour, you’ll cover all the bases. Engage with the art and architecture of the Vatican. Our guides are passionate art experts, full of stories and familiar with even the smallest details of these massive museums. With groups of just 14 or fewer, you'll find them easy to engage with. 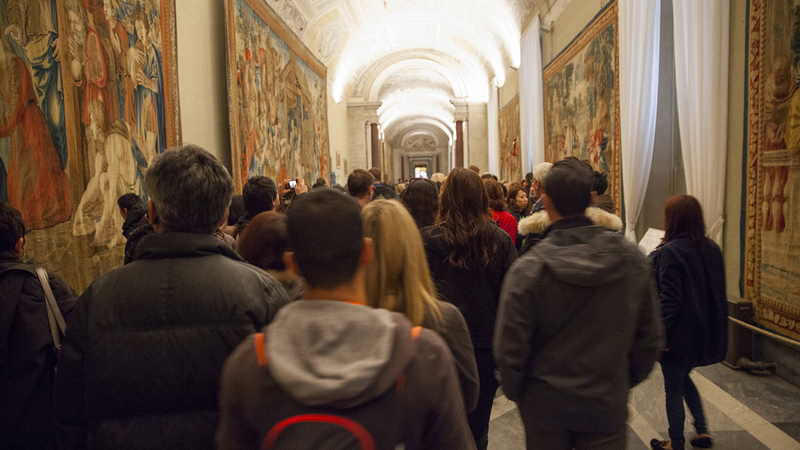 Visiting the Sistine Chapel can be the highlight of your vacation, but only if you beat the crowds. Our Pristine Sistine Chapel tour is the product of 7 years of constant development and refinement. Through it's finely tuned itinerary, you'll use skip the line Vatican tickets to enter the Vatican the Museums a full hour before the general public and enjoy the most peaceful experience of the Chapel available. Along the way you'll also get a peek at famous rooms like the Gallery of the Maps, the Gallery of Tapestries or the Raphael Rooms. 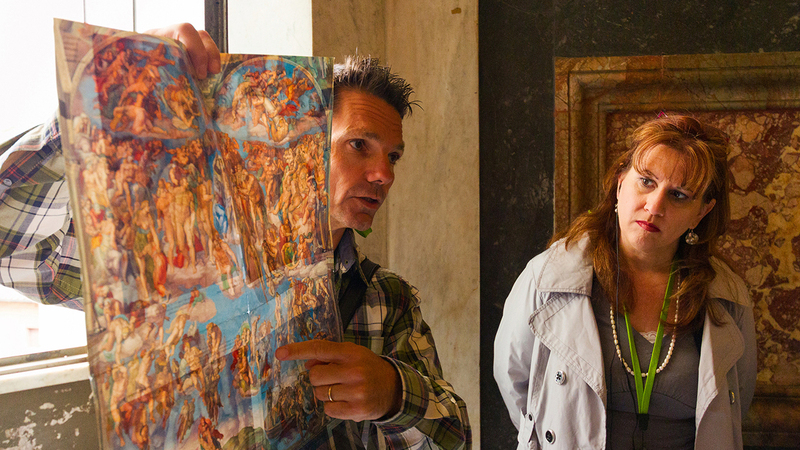 The guide for your small group Sistine Chapel Tour is a seasoned expert. They know how to read the crowd and their aim is to get you to the Chapel at the most peaceful time (always before the 9am opening). During the peak months of high season and a few days over Easter, there will be some groups inside the Sistine Chapel when you visit, but you'll always have much more space than other times of day. Take your time and enjoy some of the most iconic works of art on earth. After 15 or 20 serene minutes visiting the Sistine Chapel, You'll embark on a full-guided Vatican Museums tour and St. Peter’s Basilica tour. Visiting the Vatican Museums can be daunting but our guides have been carefully chosen as the perfect travel companions. They'll show you the highlights of the collection and enrich your visit with witty anecdotes and entertaining details to bring world-famous works to life. Traveling in small groups of only 14 people or fewer (with personal headsets) you’ll always be able to hear your guide and engage with their stories, asking all the questions you can think of. We won’t finish at the Vatican Museums though. Our next stop is the world’s largest Basilica. From the Vatican Museums, we use a special-access corridor to enter St. Peter's Basilica, skipping the enormous general-access lines. Inside, you'll enjoy a full St. Peter's Basilica tour including Bernini’s monumental altar canopy, Michelangelo’s moving 'Pietà' and the titanic dome. Most people only visit the Vatican once in a lifetime. 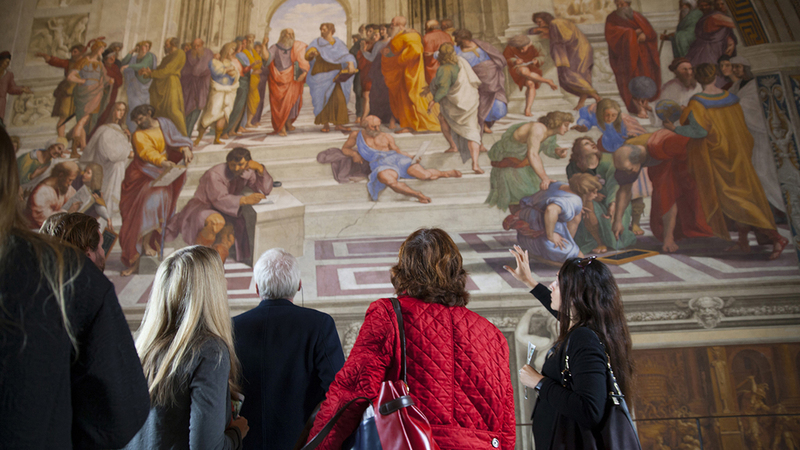 Our Pristine Sistine™ Chapel Tour guarantees that you have a once-in-a-lifetime experience when you're there. The tour was fantastic and we were very pleased. Jeb did such a great job and he is very knowledgeable in so many areas. I really appreciated the paper map of the pristine chapel and the explanation beforehand so that when we got there, we knew what to look for. I also appreciated learning about all of the art and history at the basilica and Vatican museum. We were a group with children and the information was presented so all levels could understand. The tour was worth the price!! Maria was great! She got us into the Sistine Chapel before everyone else and was an absolute joy to listen to. She covered a huge amount of material in a very short time and knew exactly where to take us. She was also constantly checking on everyone in the group to make sure they were comfortable and happy with the tour. Very professional! Luigi was great! He was very excited about everything and it was contagious! As with all museums, particular galleries of the Vatican museums can sometimes be closed without prior notice and pieces removed for restoration or loan. In the case of a gallery being closed, your guide will take you to another section of the museums instead. Also, please remember that the Sistine Chapel is a holy place, and attire must be appropriate for the visit. Both men and women are asked to wear clothing that covers at least the shoulders and knees. Walks of Italy cannot be held responsible for denied entry due to improper dress. Please note that, since the chapel is at the end of the Vatican visit, it is sufficient to bring extra coverings with you and put them on before our entrance to the holy areas. Note: We advise our clients that St.Peter's Basilica may be closed during special celebrations/festivities, including the Easter ceremonies. If this occurs during your visit, we will spend more time inside the Sistine Chapel and the Vatican Museums. Your guide will still give you an introduction to the church should you wish to visit this on your own at a later occasion. We are unable to provide refunds or discounts. IMPORTANT: While the Vatican Museums are equipped with elevators for wheelchair access, they are not conveniently located on the group tour route and only give access to specific sections of the Museums. Please contact us at info@walksofitaly.com if you have walking disabilities or if you are in a wheelchair. We can then work out a suitable alternative. Please ensure that all members of your party have a valid ID on them on the day of the visit. This is particularly important for guests who have qualified for a senior, student, or child reduction. 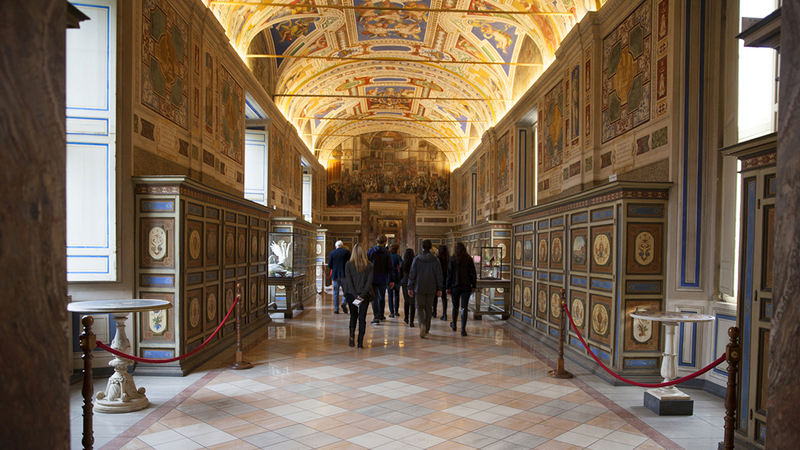 For details of what you may and may not bring inside the Vatican Museums (you may not, for example, carry backpacks), click here. Guests who do bring these items will be required to leave them in the Vatican cloakroom and will be responsible for collecting them at the end of the tour. Please note that it is a 15 to 20 minute walk from St. Peter’s Square back to the entrance of the Museums.